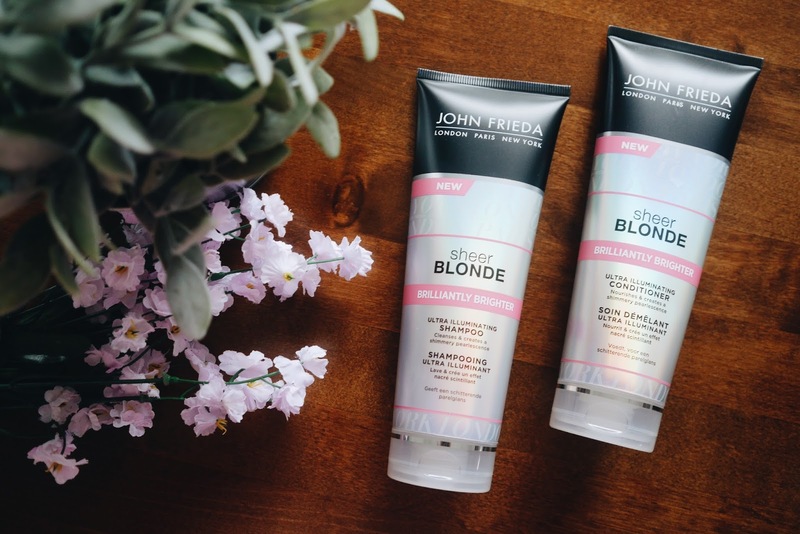 Utilising the powers of John Frieda’s patented technology they promise to encourage blondes to discover new depths; perfecting the hair from within for brilliant reflection and shine, and providing a translucent color effect that adds layers of shimmery pearlescence toenhance your blonde shade with every movement. Despite the apprehension before my hair transformation, on the whole I’ve been quite happy about leaving my natural blonde behind. I’ve enjoyed being able to experiment with new make up, and playing with fashion colour combinations when trying to work out what works well alongside my new reddish brown locks. Okay, occasionaly I get slight pangs of nostalgia when I see an insta-babe with beachy highlighted waves, but they aren’t long-lasting enough to make me return to the colour that had always been my trademark. 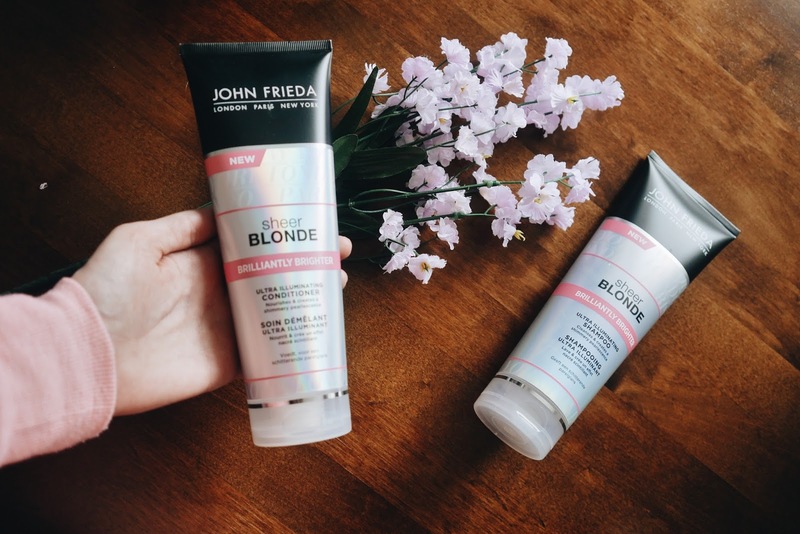 Then these new John Frieda Sheer Blonde Brilliantly Brighter products arrived, looking resplendant in their iridescant tubes, and I coudln’t help but feel a bit sad that I wasn’t able to test them on my own hair on this occasion. 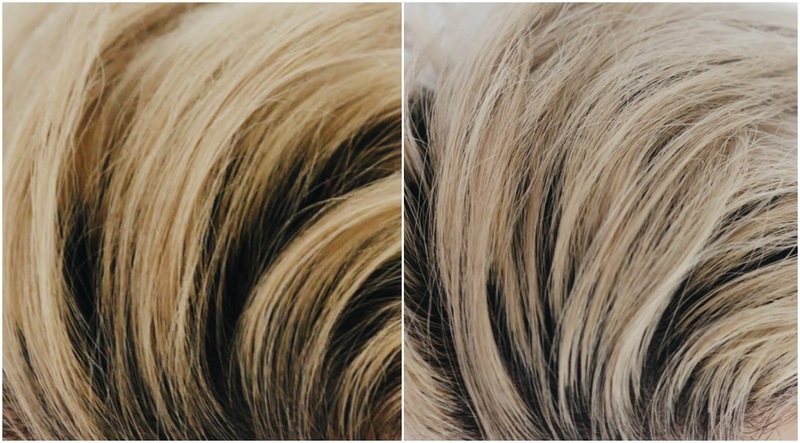 I used to love how my blonde hair could freshen and sparkle with use of targeted products. Luckily there’s a new blonde in the household in the form of my hair conscious boyfriend Simon, who got bleached ahead of his latest band tour across the UK and Europe. He wanted to make a bit of a statement and have an appearance that popped on stage, hoping that all the pictures the photographers took would make for great instagram fodder, so decided to turn his thick, dark japanese hair into a bright blonde. When he’s behaving, and we’re on good terms, I refer to him endearingly as Billy Idol, when he’s not I’ll compare his mop to Miley Cyrus or Annie Lennox. Both hair idols in my eyes, but not exactly the style aesthetic he was aiming for. It wasn’t long after his makeover that he was a true convert of the powers of the purple shampoo, realising how dyed blonde hair has such an annoying eagerness to go brassy and yellow. 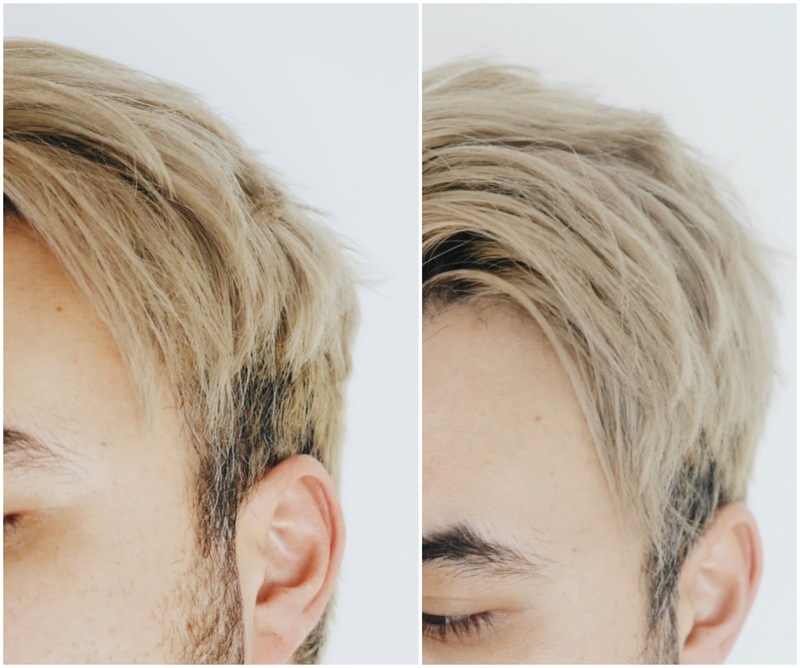 While the well known brands did the job at maintaining the right bright shade, he did find he was sacrificing something in the haircare process, so I was interested to see how he would get on with these products. The first thing he mentioned after the first use was that unlike the silver shampoos he’s used since his bleaching, this brightening shampoo still lathered up in the way we expect shampoo’s to. I agreed with him that the process feels somewhat unsatisafactory if there is a lack of lather, or a change of consistency when rubbing the product through wet hair, so this product was already impressing. When you squeeze the product into your hand you notice that it’s a transluscent white with s pearlescant reflection, which instantly gifts you with confidents that it will inject similar effects into the strands of your hair. Both products have got a lovely fruity aroma, which isn’t too overwhelming but nicer than the chemical smell many products with a definite colour-effecting function seem to have. When he rested his head on my lap, which he does when we’re watching TV and when he’s hinting at a back scratch or head massage, I got a nice whiff of his newly washed and conditioned head, and it was very pleasant. 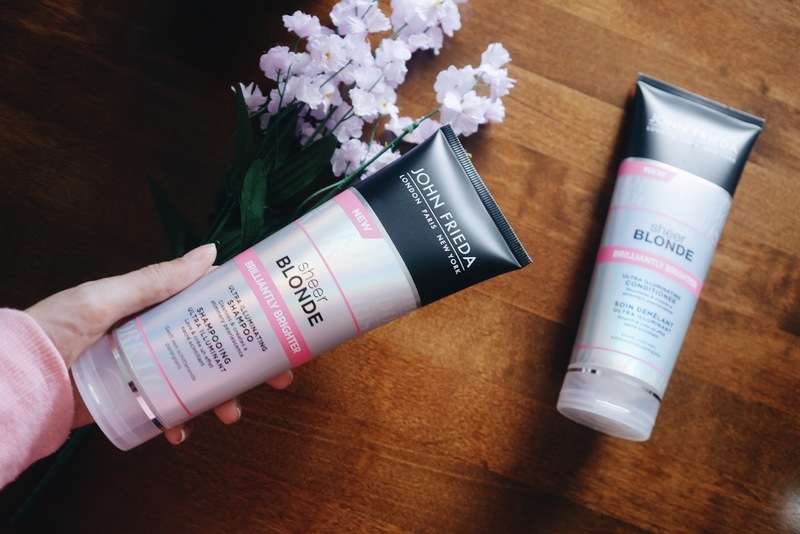 These products have John Frieda’s patented technology to penetrate and perfect the hair from within, improving each strand’s reflective capabilities and resulting in a noticeable luminosity. Si has slightly wirey/course hair due to his heritage, so when bleached it tends to get a bit frazzled and looks fairly matte. While this didn’t inject a huge amount of shine it did give it a smoother finish and turn the slightly yellow blonde into a more attractive pearlier shade. When given some care my hair as the ability to really shine, so I can imagine that this product would have been even more effective on my former blonde locks. It’s easier to notice gloss and shine on longer hair too as there is more space for the light to reflect, so I’m kicking myself that I didn’t try this in October before I went to the dark side. 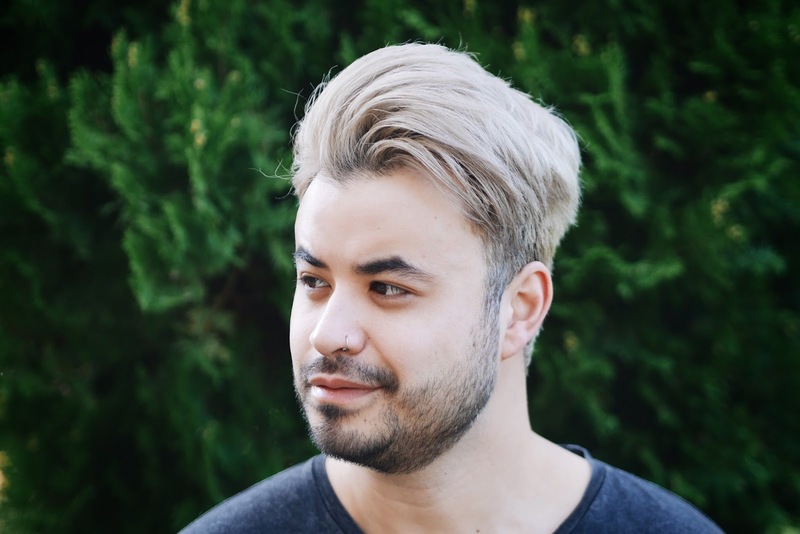 Si was very happy with the process and result of using these products, and plans to continue to use them the rest of his time as a babe’in blonde. This is NOT a sponsored post, but the products were sent for review purposes. Next Post Why can’t I take a compliment?